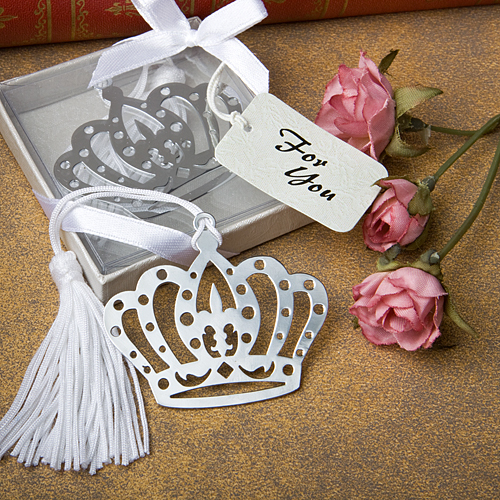 Greet your guests in royal fashion with these crown design bookmark favors! Whether you're celebrating a Cinderella themed Quinceanera, a Princess Sweet 16 or fairytale wedding, shower or birthday, these crown design favors are bound to fill the room with castle-worthy appeal. Each crown bookmark measures 1.875" x 1.75" (6" in length including tassel) and has a cutout shiny silver metal crown charm with a central fleur di lis design and an attached white satin tassel attached at its top for marking your last-read page. Each crown bookmark comes packaged in a clear topped box with a silver base with an embossed rose design, wrapped with a white satin ribbon and an attached white "For You" tag with a subtle rose design.